vegan. Photo courtesy HouseFoods.com. Allergic to eggs? Lactose intolerant? Vegan? Cholesterol-averse? You can still celebrate National Chocolate Mousse Day, April 3rd, by substituting soft tofu. While traditional mousse recipes use heavy cream and eggs (high in calories and cholesterol), House Foods America provides a healthier and vegan-optional alternative for you to celebrate National Chocolate Mousse Day. House Food’s Soft (Silken) Tofu is a flavorless ingredient that can transform itself into any flavor or texture (find more recipes on the company’s website). The recipe delivers a smooth texture that, when blended with semi-sweet chocolate, milk or coconut milk, vanilla, cinnamon and cardamom, creates a luscious dessert that tastes just as indulgent as the traditional version. This recipe serves 4-6, and takes only 15 minutes to prepare. 1. Open the tofu package and strain out the water. Remove tofu and blend in blender until smooth. 2. With the stove on low or simmer, melt the chocolate chips and milk in a pot, stirring until smooth. Add the tofu mixture and stir until it is blended evenly with the chocolate. 3. Stir in vanilla, cinnamon and cardamom. Quickly remove from heat, cool in a bowl or individual serving dishes and set in fridge until the mixture becomes mousse-thick. Top the pudding with toasted slivered almonds or other nuts, coconut shavings, or cocoa powder. Or, try these 12 mousse garnishes. 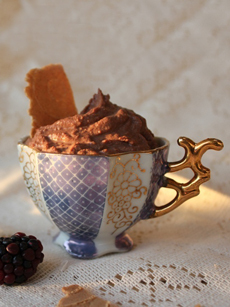 For a spicy Mexican chocolate mousse, replace the 1 teaspoon of ground cardamom with 1/2 teaspoon of chile powder. Add a half teaspoon of agave nectar for an even sweeter pudding. Here’s Julia Child’s chocolate mousse recipe, and the history of mousse.